Speedar is part of a range of hand-held radar speedmeters, operating in the 24GHz band, intended for the measurement and display of the speed of vehicles approaching or receding from the operator. It will require minimal re-training effort for any operator familiar with hand-held traffic radar although it does incorporate features not normally found in current radars. These are explained in the text that follows and also under the Operating Instructions on page 22. The models described are Speedar SR1, the basic speedmeter, Speedar with a Repeater Display, Speedvision, the Speedar with added Video camera and screen and Speedlog, the traffic data logging radar. The unit is a complete one-piece, gun-shaped, hand-held Doppler radar formed from a sturdy aluminium extrusion with a rubber handle and built-in lanyard fixing. The repeater display is housed in a rugged aluminium free-standing case with rubber feet and carrying handle. The Speedvision additionally contains a high definition video camera and lcd colour viewing screen which may be folded down when not in use. The 128 x 64 dot graphics display allows the display of proper rounded numerals with no possibility of erroneous readings due to segment failure. There is a built-in real time clock showing time of day, which automatically shows the time at which the lock button was operated, together with a storage facility to display the relevant speed limit when a reading is locked, so that speed, direction, time of offence and speed limit are all shown on the display at once when the lock button is pressed. Speedvision also shows video of the target with the above details superimposed on the frame. The video is frozen when the lock button is pressed. The speed shown by the Speedar will be repeated on the repeater display for oncoming traffic only. The direction of the target which the Speedar is tracking is shown on the display to assist the operator when checking the speed of a vehicle where there is more than one possible target (this information is also shown when the reading is locked). Repeater display shows the speed of oncoming vehicles only. Speedvision includes the direction information superimposed on the video output. Speedlog indicates direction by means of arrows and the legends TO and FROM. Readings may be locked with the lock button on the handle and will be erased when unlocked. THEY CANNOT BE RECALLED THEREAFTER. In addition to the normal Speedar lock, the video frame will also be frozen with Speed, Direction, Date and Time superimposed on the frame. Readings are stored at each press of the trigger button when a target is in view. 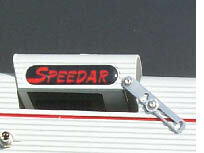 Speedar used with repeater display and Speedlog. A built-in RS232 link enables speeds to be output to a repeater display or a portable printer either in real time or when the lock is operated. Speedlog sends stored traffic logging data to a pc. No adjustment is possible or permissible. All timings are generated by the crystal-controlled microprocessor. The time of day is generated by an independent crystal-controlled clock with battery back-up. An accurate tuning fork is used to verify system accuracy. Additionally, there is an inbuilt check which gives a reading of 057 to verify correct circuit functioning. This compares the two internal crystal-controlled clocks against one another. minimum, 10mW maximum, typically 0.22mW/cm2. Antenna Waveguide horn (also used by transmitter). the direction of motion of a target. Permanently attached Sony FCB-1X47/P colour camera module with automatic focus and exposure control. Zoom controlled by Speedvision to approximate to the radar beam width. 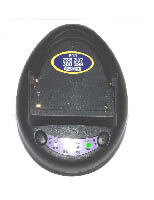 Speedvision only, 3½” pal lcd backlit display. 6V Nominal supplied by a rechargeable, clip-on NiMH mobile-phone battery. Socket for external 12V battery to supply screen backlight. Camera also supplied from external power when connected. No voltages in excess of the input supply voltages are developed. Servicing may be undertaken with no special precautions other than static protection. All components are solid state; all signal processing functions are accomplished using CMOS integrated circuits. System control is handled by a microprocessor, an independent battery backed-up real-time clock maintains time of day and date (optional) and a built-in RS232 interface allows for the transfer of data to or from the radar (optional). Speedar SR1 standard version, none. Speedar with remote display and Speedlog, 9 pin D connector supplying speed and direction information, 2400 Baud, 8 data, no parity, 2 stop bits. Speedvision, pal video VBS 1 Volt p-p (Sync negative). The unit is gun shaped, 270mm long and 90mm square cross-section, not including the handle. The unit is adapted from the standard Speedar to have a fold-up viewing screen, a built-in video camera and a connector for display power and video output. The display is housed in a rugged waterproof aluminium case with a fold-down cover to protect the window when not in use. Additionally the cover when folded up shows the message YOUR SPEED or other message as ordered. The case is a robust aluminium extrusion with a rubber handle fitted with a lanyard fixing ring. Clip-on automatic connection using Ericsson compatible mobile-phone batteries type 237. The electronic components are assembled on a single printed circuit board which may be removed and tested without having to unsolder any wires. The display and switches are on a separate board which plugs into the main board. Any NiMH charger suitable for an Ericsson type 237 battery may be used including in-car chargers. The charger supplied will recharge the battery within one hour. The charger supplied should be switched on before the battery is inserted. When the charger has powered on, the battery may be inserted and the large NiMode button should be pressed once for fast charge. Subsequent presses of this button cycle the charger through fast normal and slow charge. When the battery is fully charged, the charger will make a warning sound and the full indicator will show. New batteries should always be conditioned by fully charging and discharging them 3 times to attain their maximum capacity. Discharging should be carried out by pressing the DIS button after the NiMode button. Any discharged battery that is not warm to the touch after charging, or shows full after a few minutes charge, will need conditioning. The charger for the repeater display is built into the case of the display and requires connecting to the mains with the lead supplied. The internal battery will be recharged in 14 hours and is sufficient for about 40 hours use between charges. It is however recommended that the unit be charged overnight every other day when in use. Neither the Speedar nor the repeater display batteries should be allowed to fully discharge while the equipment is switched on. In the case of the Speedar, Speedlog and Speedvision batteries, damage to the display screen will result if these are regularly allowed to fully discharge while the equipment is switched on and left on for long periods. To avoid this possibility it is recommended that the battery is removed when the Speedar is put away in its carry case for any period exceeding 3 hours. This avoids the possibility of inadverdently switching on the equipment as it is stowed in its carry case. The Speedar hand-held traffic radar equipment is based on the well-known and legally-accepted principle known as the Doppler effect. This is a fundamental law of physics first demonstrated by the Austrian physicist Christian Doppler in 1842. It applies to the alteration in frequency caused when a wave of energy of any sort is reflected or transmitted from a moving surface. Everyone is aware of the operation of this principle in everyday life, albeit unconsciously. For instance, its effects are shown whenever a vehicle passes whilst sounding its horn. As the vehicle approaches, the sound from its horn is perceived to be at a higher pitch than when it is receding. As applied to traffic radar, the Doppler effect means that a radio frequency signal emitted from a stationary radar and reflected from a moving target will experience a change in frequency of the reflected wave directly proportional to the speed of the target, relative to the radar transmitter. In whichever direction the target is moving, the change in frequency will be the same for the same relative speeds. The difference between an approaching and a receding target being that an approaching target will give a reflected frequency higher than the transmitted frequency, a receding target will give a reflected frequency lower than the transmitted frequency. The Speedar transmits at 24.10GHz. The transmitted microwaves strike a moving target vehicle and some are reflected back. If the vehicle is approaching, more waves, ie. a higher frequency, will be reflected back to the radar; if the vehicle is receding, less waves, ie. a lower frequency, will be reflected back to the radar. The difference in frequency between the transmitted signal and that received back after reflection is known as the Doppler shift. This frequency shift falls within the audio band for the transmitter frequencies and vehicle speeds for which the equipment is used. The circuitry in the Speedar compares the frequency of the transmitted and reflected signals in a homodyne mixer and from the Doppler audio difference frequency that is detected, the circuitry calculates and displays the speed and direction of the moving target. This section applies to all Speedar devices and must be read and understood before using the equipment. Over the years since its introduction, much has been said about the use of hand-held radar as a method of speed limit enforcement. Criticisms have come from the motoring press, motoring organisations and expert witnesses, some of which have been justified, others have not, due to mis-information. It is now however generally accepted as an accurate and reliable form of speed measurement. These notes are intended to assist in establishing a method of operation designed to avoid pitfalls and instil confidence in the user of the equipment. It must be made clear from the outset that hand-held radar, or any radar which transmits its beam down the road, has its limitations. There are circumstances and environments to which different methods of detection are better suited. However, hand-held radar in the right place and in the hands of a properly-trained operator is an effective and easy-to-use method of speed measurement. Target identification is the first essential and should form a major part of operator training. An operator must consider every approaching or receding vehicle in front of the radar as a possible target, whose speed could be displayed, regardless of its position relative to the radar device. This requires the operator to be aware of all vehicles including those outside the normal beam coverage area. To achieve this end, it is necessary for the operator to understand the properties of the radar beam, about which there have been more misunderstandings and erroneous statements than about all other aspects of the use of hand-held radar combined. The radar signal is generated in a miniature transmitter device called a Gunn effect diode, located in the oscillator cavity. This device produces an oscillating electrical signal. This signal is directed through a coupler and out of the horn in a cone shape. At any one frequency, the width of this cone-shaped beam is a function of the aperture size, that is, the opening at the end of the horn. The larger and longer the horn, the narrower the beam; narrowing the beam in this way is relatively cheap but has obvious disadvantages if the resultant horn becomes too cumbersome to use. The radar beam can be reflected from various objects, just as a light beam is reflected from a mirror, and obviously the closer the reflector, the stronger is the reflection. Such potentially-reflecting objects include road signs, telephone boxes, metal hoardings, bus shelters, park railings, etc. Maximum reflection will occur only if the angle of the object was such as to reflect the beam directly to the rear of the operator. In a typical situation the reflector is usually so angled, or so far away, that it subtends a small angular portion of the total radar beam, so that at no time would a vehicle approaching from the rear, produce more return signal than one approaching from in front in the centre of the beam. If there is a large and critically-positioned reflecting object and no vehicle approaching from in front, the Speedar may briefly read the speed of a vehicle approaching from behind the operator. However, no properly-trained operator would be using a radar in these conditions. This effect can be demonstrated by pointing the Speedar at the wing mirror of a car from a distance of about two feet. It will be possible to measure the speeds of vehicles approaching from behind the car out of sight of the operator. Note the direction indication will be correct, i.e. approaching, since the vehicle will be approaching the operator although moving in the direction that will be seen as receding once it has passed the reflector. RF Interference legend on the display. No further operation of the Speedar will be possible until the interference source is removed. If the source of interference is stationary and local, this possibility should have been discovered during initial site checks for interference and that site ought not to have been used. All the factors outlined in the preceding paragraphs must be taken into account when selecting an operational site for speed limit enforcement. The recommendations which now follow go in many respects beyond the purely technical needs. However, it is imperative not to allow, through carelessness, areas of doubt which may be used as a defence, bearing in mind that a defendant needs only to cast doubt on the validity of the evidence of the prosecution to be acquitted. An operator must take every precaution not to use the Speedar where there is the slightest doubt about the circumstances. Choose a location on the highway where oncoming vehicles can be seen over a sufficient distance (the higher the speed limit, the greater this has to be) to allow, after speed estimation, a stable reading before locking the reading. Ensure that the vehicle being checked will, throughout the check period, be in sight of the operator, remain near the centre of the beam and that no obstructions such as hedges, fences or buildings come between it and the Speedar. Historically all the above have been considered to present the possibility of false readings being caused on the radar, experience shows however that most in fact cause no malfunction of the radar and provided the safety checks are carried out at the proposed site and there are no spurious readings produced, the radar can be used at sites containing overhead cables and television transmitters, Other aerials such as are found on mobile phone masts are normally of very narrow beamwidth which in general will not generate any significant field at ground level. Provided the operator is out of the line of sight of the aerial horn and the safety checks have been thoroughly carried out, it will be safe to use the radar in such circumstances. To remove any doubt, always check thoroughly by searching with the Speedar throughout 360°. Do this by holding the Speedar in the normal way and rotating in a complete circle. Repeat this with the Speedar held above and below the normal angle of sight. If any readings not due to traffic appear on the radar display, or if the RF Interference legend appears, then move to a location with no interference. Avoid positions near possible reflections from road signs, telephone kiosks, metal bus shelters, metal hoardings, large metal doors on factories, sheds, etc. metal fences, railings or similar objects. As a guide, one should keep at least 15 yards distant from small objects (e.g. lampposts) and up to 50 yards from large metal buildings, hoardings and the large type trunk route advanced direction signs. Once an acceptable site has been found, re-check the correct functioning of the Speedar by means of the internal test and tuning fork. It is advisable, though not essential, to check the Speedar against the certified speedometer of a police car. This test is understood by magistrates and is recommended vide the case R v Hughes 1981, although it is less accurate than the inbuilt test and tuning fork. Speed checking may now start, remember that the Speedar corroborates the speed of a vehicle as estimated by the operator. Therefore the target vehicle should be identified and estimated as travelling in excess of the speed limit before the Speedar is used. A stable reading must then be held for three seconds. This can be judged from three blinks of the display. A stable reading is defined as a reading which does not vary other than by small increments (if the target is accelerating or decelerating) and is in keeping with a trained operator’s observation of the behaviour pattern of the target vehicle. The recommendation of three seconds is not in any way essential to the operation of the Speedar itself, each speed reading measured by the Speedar is a separate event and is not influenced by previous readings. The time of 3 seconds is given as a recommendation by ACPO. However, it should be pointed out that radar driven traffic cameras for instance are deemed to be accurate after a single reading. It is only after all these points have been satisfied that the speed reading should be locked by depressing and releasing the lock button. A constant reading accompanied by the Locked legend will now be displayed. The display will also show the time at which the reading was locked and the current speed limit (provided that this has been set correctly beforehand) and will remain held on the display until cleared by pressing the lock button again. Where there is only one vehicle in the beam, target identification is no problem. If more than one vehicle was present, the strongest reflected signal will predominate. The display will also indicate the direction in which the tracked vehicle is moving aiding the user in identifying the vehicle. This is generally the nearest vehicle but see the paragraphs under Target Identification on page 12. Should two signals of identical strength but different speeds be received simultaneously, the display will blank out until one signal predominates. As traffic density increases, the display will switch from vehicle to vehicle and from direction to direction following the strongest reflected signal until such time as a stable reading is impossible to obtain. The task is now beyond the scope of the Speedar or any radar device. Under no circumstances should the operator try to exclude unwanted vehicles by panning the beam. At all times the beam must be directed straight down the centre of the road. See under Cosine Error page 19 for the errors caused by not having the Speedar pointing directly at a vehicle. The Speedar is designed to operate from 6V. Should the voltage drop below 5.8V the range of the Speedar will start to reduce. When the battery voltage falls below the minimum acceptable level, Low battery will appear on the display and the Speedar will cease to operate. The battery should be removed and charged with the charger supplied. The spare battery should be fitted and speed checking may continue. In normal use a battery will last for six hours without charging; it may be charged in one hour or less using the charger supplied, or may alternatively be charged with an in-car charger unit supplied as an optional accessory. Chargers suitable for Ericsson type 237 batteries may be used if available. Speedvision uses the same battery as the Speedar but in the case where there is no external battery attached to power the display, the video camera is also powered by the Speedvision battery. In these circumstances the battery life is reduced to 2 hours. The Repeater display has its own internal 12V NiCd battery and mains powered charger. Battery life is normally 40 hours. It is important to aim the Speedar down the road as nearly parallel to the road as possible. DO NOT FOLLOW THE VEHICLE with the Speedar as this will lead to inaccurate (too low) readings as the angle between the Speedar and target increases. For the same reason, the first reading taken as a vehicle passes the operator coming from behind will be lower than the true speed. 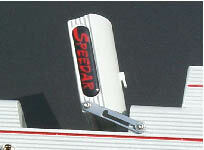 The Speedar is designed to exclude any targets travelling slower than about 12MPH (19km/h). The range of the Speedar is 400 to 600 metres dependent upon the size and shape of the target vehicle and the prevailing weather conditions. Heavy rain will reduce the range. The operator should be aware however that the Speedar will be able to see vehicles through mist or fog which may be invisible to the operator. The Battery low legend appears in the display when the battery voltage has dropped below a preset level. The Speedar ceases to operate whilst this indicator is on. The battery should be removed for charging and replaced by a fully-charged spare. It is important that the batteries should be charged after use so that they are always ready for use. They cannot be overcharged using the charger supplied and may be left plugged in for up to 12 hours when not in use. The charger supplied will fully recharge the batteries within one hour or less. Being Nickel Metal Hydride the batteries are not subject to any form of memory effect and need not therefore be fully discharged before charging. If a Speedar is not used for a long period, the batteries should be charged before use. In the presence of radio frequency interference of a greater strength than the Speedar can tolerate before giving false readings, the legend RF Interference will appear on the display. The Speedar will not operate whilst this is displayed and therefore no false readings can be shown in the presence of interference. When a repeater display is attached to a Speedar, the basic operating instructions are unaltered. The Speedar is still operated in the normal way, its readings however are also shown on the repeater display so that oncoming traffic can also see the speed the Speedar is reading. For obvious reasons the repeater display will only show the speeds of oncoming (relative to the Speedar) traffic. When connected to a repeater display the speedar is only approved when using the cable supplied by the manufacturers. This cable is three metres long. There are only two additional controls on the repeater display which need to be set before use. The thumbwheel switches on the rear of the display should be set to read the MINIMUM speed which is to be shown by the repeater display. Only speeds greater than this number will be displayed. Loosen the screw fasteners each side of the cover stays and swing the cover upright to show the warning message YOUR SPEED, reposition the stays to hold the cover upright and re-tighten the screws. Plug in the connecting cable at both ends and tighten the thumbscrews (Speedar end). Attach the plug to the repeater display carefully, it will only fit one way round and should not be forced. Push the on/off button and the ON light will illuminate, if the light remains off the internal battery is flat and must be recharged. Speed checking may now be carried out in the normal manner. If it is required to change the minimum speed reading on the repeater display the unit must be switched off and on again to recognise the new value set on the thumbwheels. 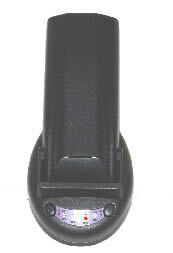 The internal battery in the repeater display is sufficient for 40 hours use. The unit should be recharged at least every other day when in use. The internal charger must be connected to the mains supply using the lead supplied and the charger switched on with the charger power switch. The unit will recharge overnight. It is important that the display is switched off after use as allowing the internal battery to go flat whilst the equipment is switched on could cause damage to the display and battery. Speedvision is the newest adaptation of the Speedar radar. It incorporates a high quality video camera and fold out viewing screen which enable the operator to see on screen the vehicle who’s speed the radar is measuring. Also superimposed on the screen are the speed, direction, time and date. This screen may be frozen at any time when there is a target in view by locking the Speedvision in the normal way, the superimposed information is also frozen with the picture. The video information may be output to either a video recorder, or a video printer. If a video recorder is used, the stored image has sufficient clarity that when displayed on a monitor or TV screen, vehicle number plates may also be distinguished. The viewing screen allows the operator to choose the optimum moment to freeze the video so that the number plate is clearly visible. The basic operation of the radar remains unchanged from the standard Speedar thus previous training on radar speed measuring devices can be utilised allowing users rapid conversion to the Speedvision. Naturally this also means that the normal precautions used when making a radar speed measurement, as previously described, must be observed. Since, in common with the Speedar, the Speedvision shows the direction of the vehicle being measured, this makes it much easier for the operator to be certain of their target and the addition of the video screen gives further assistance in this respect. Battery power for the viewing screen is supplied by an external battery. In the absence of an external battery, the radar and camera are still operational and the Speedvision may be used in this mode if it is more convenient to observe the picture on an external screen, e.g. one incorporated in the video recorder, or if a screen is not required. Video data is output through the attached phono plug, using the same cable as connects to the external battery. All functions of the camera are fully automatic including focus, brightness and focal length of the inbuilt zoom lens. On power up, the camera is set to pre-set values for the initial focus and focal length which is calculated to give a field of view which closely approximates to that of the radar when it has a target in view. When there is no target in view, although it is possible to set the camera to a corresponding wide angle position, in practice it is difficult to arrange for the camera to zoom quickly enough In some cases to achieve the normal field of view and the camera focal length is therefore fixed at a predetermined value. All the normal checks as set out in the Speedar Operating Instructions must be carried out to ensure that the site chosen is not subject to interference. Video is available all the time the external power is connected or the Speedvision is switched on. Power to the video camera will be supplied either from the external battery or, if this is not connected, from the Speedvision battery. If video recordings of offences are to be made, connect the video recorder input to the output connector from the Speedvision. If video prints are to be made, connect the output from the Speedvision to the video printer input. Speed checking can now be carried out in exactly the same manner as with a Speedar or other radar speedmeter, with the following additional feature. When the lock button is pushed, it locks the speed reading on the Lcd display of the Speedvision, just as it would on a normal Speedar. In addition it freezes the video frame on the viewing screen at that point and the video output now becomes a single repeating frame containing the view as seen by the camera at the instant of lock, with the speed, direction, date and time superimposed on the frame. It is not possible to freeze the frame when a speed is not being measured by the Speedvision, nor is it possible to recall previously frozen frames or measurements except on the video recorder if attached. NOTE it is not possible to freeze the time shown on the video frame so this will continue to show real time. The time on the Speedvision lcd screen is however frozen as a normal Speedar would be. A further press on the lock button will unlock the Speedvision and unfreeze the video. After use the screen should be folded back down by lifting up the side latches, then lifting the screen out of its latched position and folding it back flat into the main body of the Speedvision. Because of the less robust nature of the Speedvision compared to the Speedar due to the folding screen, operators should take greater care when using the Speedvision. For instance, throwing it into the back of a car when it is not in use is a bad idea. 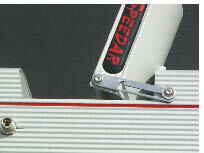 The Speedvision will be much less vulnerable to damage if it is replaced in its carry case after use. This equipment is an adaptation of the Speedar standard police traffic radar, as such it works on the same principles and should be used with due regard to the conditions described in the method of use contained in the standard Speedar handbook. The Speedlog is designed to be used to capture and store a log of vehicle speeds such as would be needed for a traffic survey. It saves the operator having to record data manually and then transcribe it later into a computer with all the risks that that incurs of miskeying or otherwise wrongly entering data. The operator simply stands or sits in a car beside the road to be surveyed and when a vehicle which fits the conditions of the survey, e.g. free flow, is seen, the speed will be shown on the display. The direction of travel, either left to right or right to left, is automatically indicated by the arrow above the To or From column and when the trigger button is pressed, one reading will be stored for the appropriate direction. The total number of readings will be incremented, the new average speed and 85 percentiles will be calculated and the results updated on the screen. The 85%ile values are only displayed when the number of readings is greater than 10. When sufficient readings have been taken for either or both directions, the display will show a total of the number of vehicles in each direction, the average speeds for both directions and a simple approximation to the 85 percentile for each direction. This will be approximately correct for numbers of vehicles exceeding 50 but it is recommended that for absolute accuracy a more rigorous algorithm is applied than can be accommodated in a relatively simple piece of hand-held roadside equipment. Switch on the Speedlog using the red on/off button. The display will show the opening screen with an arrow at the left hand side of the first line. This arrow, or the cursor in the case of data entry or choice, is moved up and down by the four green navigation buttons identified by the multidirectional arrow symbol on the Speedlog front panel. The first operation is to set the system time. Normally this will be correct as it is maintained internally, however it may be useful to utilise a local time where for instance the log is started at time 00:00 and all logged times thereafter will be relative to this, thus saving the trouble of having to work out the total time of the log or the frequency of vehicles. by pressing the yellow select button. The initial screen will reappear. set date screen will appear. As with the time, this will normally be correct as it is maintained internally. Set the date in the same manner as was described for setting the time and when correct, press the select button to store the data. The set units screen will appear. A choice of MPH or km/h measuring units is available. Once selected, the choice of units will be stored and applied to all future measurements. To change between them, move the cursor as before. When the choice is correct, store the units with the yellow select button. The initial screen will reappear. Move the arrow down to the Choose site no option and press the yellow select button. A choice of a pair of site numbers will be shown. This may be incremented or decremented in pairs by the navigation buttons as before. Sites always appear in pairs so that both directions of traffic may be logged at the same time at any site. When the site pair has been chosen, press the yellow accept button. The option will be given to clear the site of all information, the default selection is no, if the site is not cleared logging will continue from the last recorded reading at that site. This means that the logger may be switched off at some point and the logging operation continued after a break, from where it was stopped. Press the yellow button to select your choice. The site name option will appear. Each pair of sites may be given an alphanumeric name of up to 8 characters to enable the site to be easily identified, e.g. A224 or BY-PASS. This is achieved by using the navigation buttons to change the character that the cursor is blinking over. NOTE in this case the characters cannot be returned to. After the cursor has been moved off a character it will not return. When the site name is satisfactory, press the yellow button to store it. When the name exceeds eight characters it will be automatically stored when the cursor moves beyond position eight. The main selection screen will reappear. Move the arrow down to the log readings position and select it with the yellow button. The logging screen will appear. This shows the following information. The direction of traffic which the next press of the log button will store, indicated by an arrow over the active direction, either TO or FROM. The speed of the vehicle to be logged appears next to the legend Current speed.. The remainder of the screen shows the logged information for each direction. Note the 85% row will remain blank until at least ten vehicles have been logged as the reading is insufficiently accurate below this number of samples. It becomes more accurate as the number of logged readings increases, but note that using the tuning fork to test the logger and storing multiple readings of the exactly the same value will give meaningless results. to change batteries at any time without loss of data. Switching off the logger at any time will not result in loss of data. The final option on the main screen is Download. Selecting this will enable the stored data to be dumped into a PC for further manipulation. Switch off the logger, connect the cable between the logger and the PC port. This will be either Com1 or Com2. Since it is most common for the mouse to use Com1, the spare port on the rear of the PC will almost certainly be Com2. In some cases however Com2 is used by an internal modem. In this event it will be necessary either to remove the modem from Com2 either by changing the modem port selection or, where this cannot be done, by physically removing the modem, or by utilising an alternative port where this is available. Switch the logger back on and move the arrow down to the Download position. Select this option with the yellow button. An information screen will appear showing the download commands available. 2400 Baud 8 data bits 2 stop bits no parity no flow control and the comms program must be set for direct connection to the port, i.e. no modem, and ASCII transfer. To set this up using HyperTerminal proceed as follows. Open HyperTerminal, The new connection window will appear. Enter a name for the connection, e.g. Speedlog and click on OK. The Connect to window will appear. All these entries except ‘Connect using’ may be ignored. Choose the port you are using in the ‘connect to’ line and click on OK. The port settings window will appear. Set the Bits per second to 2400, Data bits to 8, Parity to none Stop bits to 2, Flow control to None and click on OK.
Having connected the logger to the PC and selected the download function, type into the HyperTerminal window the following. S (upper case) (site no) e.g. 00 followed by enter, or carriage return, (if local echo is enabled, these characters will appear on the hyperterminal screen as you type). The following information will be loaded into the HyperTerminal window from Speedlog. Then enter one or other of the following. or DT followed by enter or carriage return. D will cause a string of comma separated speeds to be dumped to HyperTerminal. This is a form in which data may be loaded into other programs, e.g. Excel, for further analysis. The stored string of speeds will be output as below. It is necessary to enter the site number before each D or DT command. Incorrect entries will be ignored by the Speedlog software, but if an enter command has been given, the site number will have to be entered again before the Speedlog will respond. The outputs from the two mixer diodes are amplified by IC1 a and b by 60dB. R1 and R2 are load resistors to match the mixer diode source impedances. C3,C5 are DC blocking capacitors. D1,D2 and D3,D4 act as limiters in the presence of overload inputs and reduce the amplifier gains to approximately 1 as the output swing exceeds the diodes forward voltages. C5,R4 and C4,R3 form a high pass filter at approximately 800Hz. The outputs from the preamplifiers are fed to band pass filters in each channel consisting of amplifiers IC1 and IC22. These filters remove the out-of-band noise and cut the bandwidth to 9KHz (800Hz to 9.8KHz). This reduces the out-of-band signals passed to the rest of the system hence improving the signal to noise ratio. IC2 forms an agc stage for each channel using Q2 and Q10 as variable resistors to adjust the gain. The other two amplifiers in IC2 form tracking filters in each channel. At the tracking filter centre frequency, the outputs will be in phase with the inputs at the input to IC4, a D-type flip flop, used as a bang/bang phase comparator. The output of this comparison is integrated by C12,C71 and used to control the resistance of Q1,Q9 which drives the centre frequency of the filter up or down. This filter will lock on any in-band frequency, once locked it rejects other input frequencies and thus helps to discriminate between multiple targets by tracking the current target frequency, until any other conflicting signal is about 6dB greater than the currently locked frequency. The outputs from the tracking filters are squared in comparators IC3,IC21 and channel 1 is fed to a phase lock loop IC5. This ensures that only one frequency can be passed to the frequency measuring circuits and also provides error signals when the frequency loop is not locked. 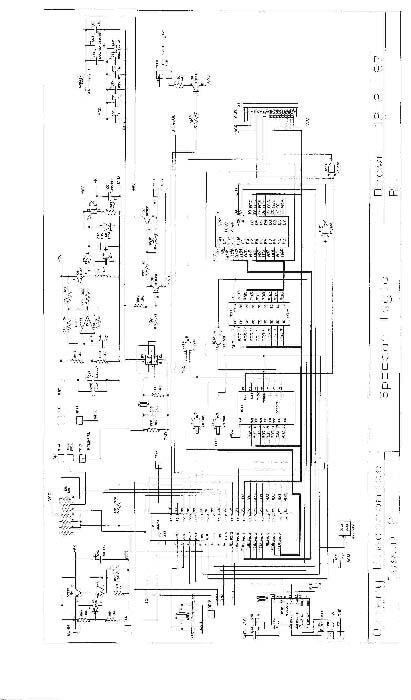 Channel 2 does not have this circuitry as it is only required to sense the relative phase of channel 2 compared to channel 1. The signal frequency in both channels will be identical. 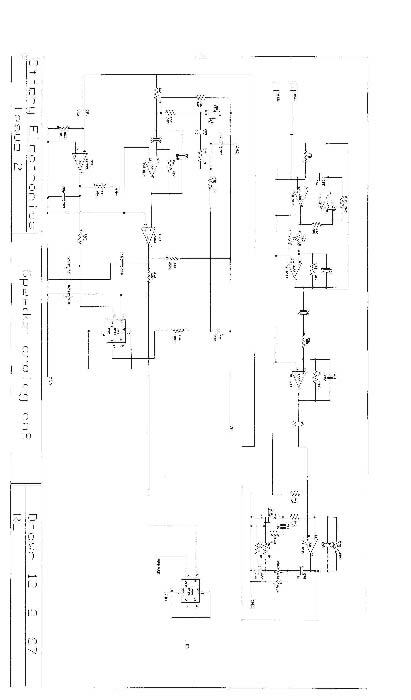 The phases are compared in IC23 and passed to the logic controller. The function and system control of the whole instrument are handled by the embedded microcontroller IC11 which with its associated memory and demultiplexing latches form an 8-bit microcomputer. The display and real-time clock are also accessed as addresses on the address bus. IC16 forms a -6V generator for the display and analog amplifiers. IC12 is a watchdog which resets the system under conditions of power fail, or software crash serviced by one IO bit from the controller. IC10 is an RS232 interface IC allowing the input and download of data to the system. The display backlight and transmitter supply are turned on or off by one IO bit each. The Doppler frequency and Doppler error signal are interrupt signals to the controller. Signal phase, RFI, lock switch, low battery and two front panel switch inputs are read by an IO port. IC15 is permanently powered when a battery is fitted and in conjunction with the switch on the front panel forms the power on/off circuitry driving Q6,Q7 to supply power to the entire instrument. The real-time clock IC14 outputs a square wave to an IO port on the controller with a frequency derived from its onboard crystal. The frequency output is selected from a divider chain by the controller. Normally this is set to 4Hz to provide the 1-second timing interval between readings. However, under test conditions, this is set to 4096Hz and measured by the controller as if it were a Doppler input frequency. This results in a test reading of 057 on the display and is the result of comparing two independent crystal-controlled frequencies. The video camera is separate from the Speedar circuitry and is controlled via the built-in RS232 interface in the Speedar. Power is supplied to the camera from either the Speedvision battery or an external battery if connected. This changeover is automatic. The microprocessor circuits include an additional battery backed up 64K RAM which stores all the information logged. Because of the need for additional input switches to navigate the screen, the RFI and Battery low functions are not available. 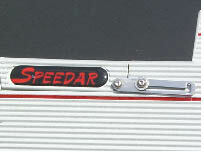 The Speedar, Speedvision Speedlog and Repeater Display are warranted to the original purchaser to be free of defects and Ottery Electronics (OE) undertakes to repair the equipment to the specification, or to replace at its option, any unit which fails because of defective parts or workmanship for a period of two years from the original date of purchase. This Warranty applies only to internal electronic components and circuitry. It excludes normal wear and tear such as broken switches, connectors, trim and cases, exterior hardware, damaged lcd displays, batteries and physical abuse. The Speedar, Speedvision and Speedlog should be kept in their carry cases when not in use. The Repeater Display should have the protective cover folded flat against the display window to protect the window from scratches. OE holds stocks of component parts and printed circuit boards. In normal circumstances, OE is able to repair and return by carrier, equipment within 72 hours of receipt. If damage or malfunction is suspected for any reason, the initial checking procedure should be carried out and if the equipment is not functioning correctly, it should be returned to OE with, wherever possible, full details of the type and circumstances of defect or damage incurred. Each Speedar or Speedvision is supplied with a Calibration Certificate covering both the unit and the tuning fork. Both should be returned to OE annually for re-calibration as required by Home Office regulations. A record is kept of calibration dates and, if required, users can be notified when re-calibration becomes due. This miniature charger will fully charge a battery in about 2 Hours. There are 4 leds and 2 switches visible on the front of the charger, these have the following functions. The red CH LED will begin to flash showing that the battery is charging. RIGHT Button marked LI this is for lithium ion batteries only and should always be in the UP position with the RED LI LED Extinguished. As the battery becomes charged, the green FULL LED will begin to illuminate until the battery is fully charged and the green FULL LED is fully on. At this point the red CH LED may stop flashing leaving just the green FULL LED alight. The battery is now charged and should be warm to the touch. Plug in the charger, the green FULL LED will light.